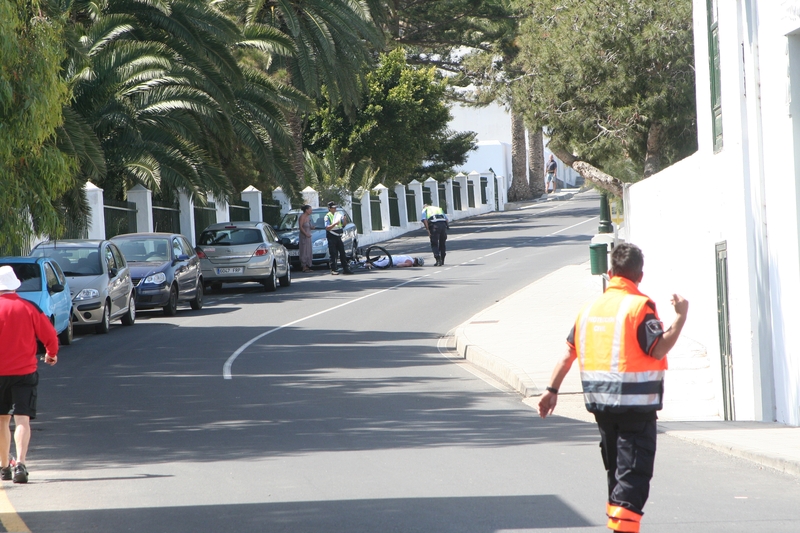 I can’t write much about this myself, as I have no memory of the accident, race day or the following week I spent in Hospital Dr Negrin on Gran Caneria. I have however been able to piece together the cause and my subsequent re-location to Gran Caneria through family who were out with me, and the team at Club La Santa whose help and support has been phenomenal. We were sitting right at the bottom of the hill in Haria and watched the bikes come down the hill, Chris must have been in the first 30/40 bikes and was on his own as he descended down the hill, we think that he either was taking out or replacing his drink bottle when he probably hit a pothole or something and his front wheel turned and he came down heavily on the road. This happened at 11.20hrs (this was the time on the camera) It is hard to estimate how long it took for the Ambulance to arrive but I would guess approx 10/15 minutes. The last picture I took of the bikes which also showed Chris in the background, was 11.41hrs this was just before he departed in the ambulance. As soon as he crashed the police marshalls immediately left their positions and went to help him. They couldn’t do a lot other than call an Ambulance and make the area around him safe, put barriers up etc., to divert the oncoming bikes. Chris had actually landed in a recovery position but appeared to have knocked himself out. There were quickly quite a few people around him trying to help. When all the police and marshal’s left their positions to go and help him there was complete chaos down in Haria, as traffic was now turning out in front of bikes coming down the hill and some of the bikes were trying to take the road to Arrietta instead of turning to go up through the village to Mirador, there was a young lad left to marshall there but he could not cope, as all the crowd were shouting at him what to do? When the Ambulance arrived it came down a side street at the bottom of the hill and tried to turn up the hill into the oncoming bikes, he couldn’t turn for some, but a Paramedic jumped out of the Ambulance and ran up the hill to attend to Chris, I think by now Chris was sitting up? To make matters even worse it appeared that a member of the public who had witnessed the crash also collapsed on the opposite side of the road to Chris and one of the Paramedics also had to attend to him. It was amazing to sit and watch the amount of traffic which was trying to get through the village of Haria, at one point when Bert Jammer was coming through he had to slow up and actually wait for a bus full of tourist’s to slowly go around the tight bend in the village. From an observers point of view the whole part of the bike route through the village of Haria, from a point of safety should be shut off to traffic and that should also include the hill coming down from the top of Haria, but I guess this would be hard to achieve? 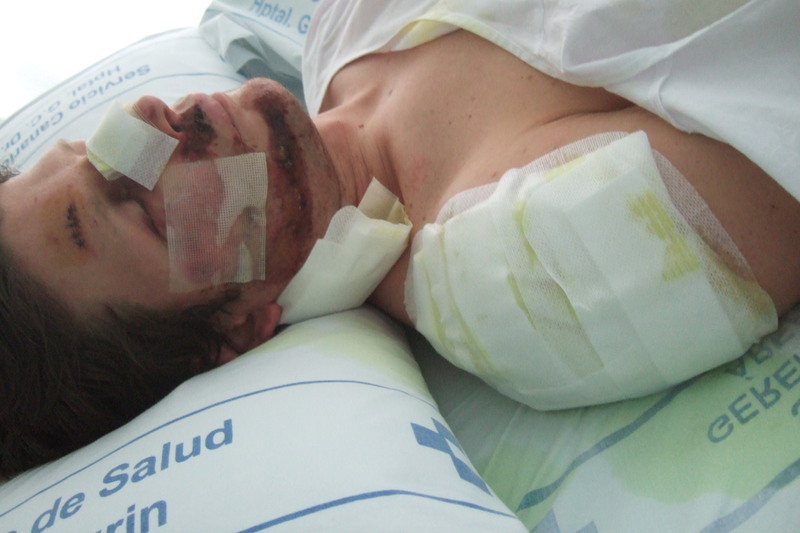 I think I was taken to Arrecefe hospital in Lanzarote where I was examined, stitched up and medicated. It transpires that I had a mild subarachnoid haemorrhage and a fracture in my C7, along with a broken nose, 8 stitches in my head, lip and I was also a few teeth down! I was air lifted to Gran Caneria on a medi-plane where I spent the next week. The hospital had specialist neurosurgeons, so I was in the best hands. I was given a safe to fly certificate toward the end of the week, and headed back to the UK, for the next round of specialist doctor appointments! When can I get back on my bike?